I hate writing personal statements. I stare at a blank page, wildly uncomfortable talking about myself and daunted by the enormous influence over my future I ascribe to this one document. Nevertheless, through an arduous process of many drafts and numerous rounds of edits, I managed to write a statement that contributed to my acceptance into grad school and a NSF graduate research fellowship. The biggest contribution to the success of my personal statement was the people who told me my current version was bad, gave advice, and encouraged me to revise. Although a quick Google search will reveal many examples of good personal statements, I wasn’t able to find any resources that really showed the process of getting to that point. Ideally, I wanted examples of what it looked like to implement the advice I had been given. Here, I hope to do just that, by providing multiple iterations of my personal statement – from the very rough first version through to the final versions that I submitted to grad schools and the NSF. Each transition, from one version to the next, typically responds to a major comment or suggestion (in addition to many small edits). First to Second: My College advisor told me, point blank, that my first draft was boring. She said that it read like my C.V., lacked personality, and needed a hook that would engage a reader going through hundreds of applications. Second to Third: My lawyer cousin said that me that although the pieces were good, my statement lacked a story, a connective thread, that tied everything together. Third to Fourth: After reformatting my personal statement to fit the NSF guidelines, I took it to a university sponsored peer-editing group. Every one who read it agreed that my statement was expositional and repetitive. I was given the common, yet frustrating, advice to “show don’t tell’. The changes between versions of my personal statement can be visualized in the introductory paragraph. I color coded statements in this paragraph based on their subject matter/ purpose. The first version was ‘boring’ because it mostly described my research interest in the context of school (yellow) and previous research experience (light blue), without personal details or overarching story. 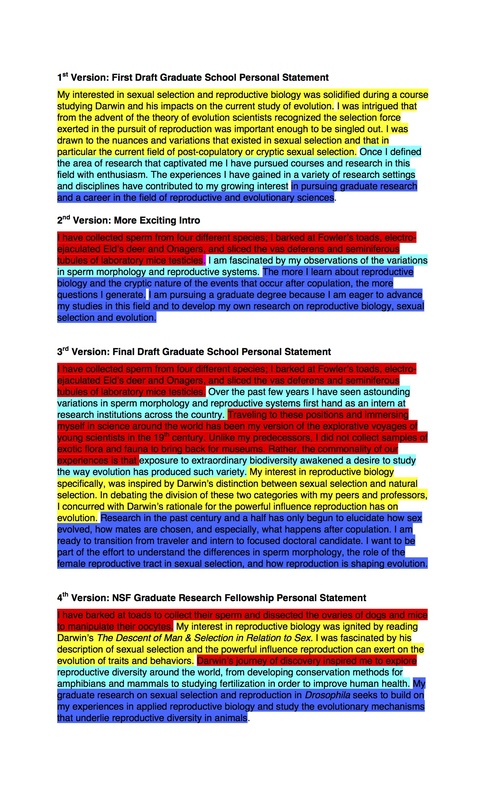 In the second version I added a catchy personal anecdote (red) and discussed my research interests in the context of future graduate research (dark blue). In the third version I tried to create a broader narrative, adding back the context behind my research interests. Finally, the fourth version is more streamlined, I eliminated some of the wordiness and extraneous details. Sharing the early versions, and even the final ones, is a bit embarrassing. There are parts that still feel rough, or are cringe-worthy to re-read. I see my personal statement as a continual work in progress, and there is still plenty of room for improvement in the ‘final’ versions. Regardless, I hope that sharing my whole process, and not just the final version, might be helpful to others staring at a blank page.